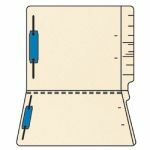 very popular end tab fastener folder with fasteners in position 1 and 3 Overall Size 9-1/2" H x 12-1/4" W. Front Size 9-1/2" H x 11-3/4" W. Undercut to 11-3/8". 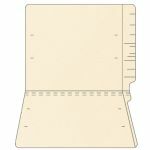 Overall Tab Length 8-3/8" H. Label Placement Marks 10 embossed. Expansion Scores 2 - 3/8" (3/4" total). Heat bonded fastener positions #1 & #3. 50/Box 250/Ctn.